Set along the Perfume River, the Complex of Hue Monuments is a UNESCO World Heritage Site in the Central Vietnam. Hue was founded as the Vietnam capital city by Gia Long, the first king of the Nguyen Dynasty in 1802. It held this position for nine Nguyen dynasties until 1945. The massive complex features hundreds of monuments and ruins, such as the Forbidden Purple City, once the residence of the royal family and badly damaged during the Vietnam War, the Imperial City, royal tombs, flag tower, buddhist temples, pagodas, a library and museum. 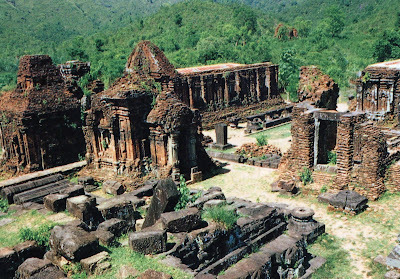 Let’s take a trip through the most important historical and cultural monument of Vietnam. 08.00 a.m: You are welcomed at Chan May port with procedure assistance to exit from the cruise and drive through northward to Hue. Today you will spend the day in Hue, the former capital of Vietnam under the Nguyen Dynasty of emperors from 1802 till 1945. We start the visit to the Imperial Citadel from where the Nguyen emperors once ruled Vietnam. Then visit Thien Mu pagoda, Hue’s most preserved religious monument standing on the riverbank with its seven-floor tower. You will further visit King Tu Duc’s tomb or King Minh Mang tomb (typical formal oriental style designed). Latest 04:20 pm you will have to drive back to the port for your departure. 10.00 a.m: Explore Hoian charming town. Hoian Ancient Town is an exceptionally well-preserved example of a South-East Asian trading port dating from the 15th to the 19th century. Its buildings and its street plan reflect the influences, both indigenous and foreign, that have combined to produce this unique heritage site. You will have opportunity to visit tailors at which you can have your dress made within hours. Thank you for your email to ABS travel. For further information, please fee free to email me. We would like to visit Hoi An / Danang on July12th from Chan May. Could you advise us on the price for 4 people and for 6 people.